Not only had I not considered perfectionism as a blog topic, I certainly hadn’t planned on my blog posts being personal! If you’ve read my books (Dare to Dream: The Art of Co-Creating with God), you know that my plans and Gods rarely match, and inevitably His always trump mine. Maybe you’ve had the same experience. What prompted God to ‘write my first blog post?’ I woke up that morning feeling very anxious, and my gut was in knots. My first thoughts were of things I wasn’t getting done fast enough. During morning prayer times, I like to set priorities for the day and run them by the Lord to be sure I stay on His time table. My priority for the previous day was to finish the content for my new website, including my first blog post, but it didn’t happen. I ran out of time. I woke the next morning feeling worried that I didn’t finish what God asked me to do. I mean, He’s God! And so began my prayer time. It started with some rational thinking. I knew it wasn’t my grounded adult self that was feeling the anxiety. I was able to assure myself that God was not mad that I hadn’t finished the website the day before. He’s a very patient God. He knows how hard I’ve been working on it. In fact (I reminded myself), everything that happens is part of God’s plan. He’s helping me create Dare to Dream, including the website, and He has been directing and guiding me from day one. ‘Co-creating with God’ is a continual learning process. It occurred to me that morning (I’m sure through the prompting of the Holy Spirit) that I could have checked in with Him when I realized I wasn’t going to finish the website to see what He wanted me to do. But I didn’t, and I woke up anxious. I’m learning to check in with God throughout each day to stay on track, but I forgot the day I tried to finish my website. I gently reminded myself that I’m going to stumble at times as I continue learning how to walk with Him. And that’s ok! He showed me that the knots in my gut were about feeling like I have to do everything perfectly. He then told me that He wanted me to write my first blog post about perfectionism. I felt a little shame as He lovingly brought my own perfectionism to my attention. Yet, at the same time I thought ‘how perfect’ that He was pointing this out. It was time to heal. I felt like my younger wounded self as I admitted, I don’t like people thinking that I’m not perfect. What if they don’t like me and then go away? Then God brought up several painful childhood memories to show me where the perfectionism started. It was my way of surviving emotionally, and it gave me an illusion of controlling the uncontrollable. Unfortunately, it stuck as a way of life. I began to appreciate why He was bringing this up, why He was showing me the lies I had believed all my life. He wanted to heal my need to be perfect. I asked the Lord for the truth, and here is what He said. I know the number of hairs on your head. I know everything about you. I created you. You are perfectly imperfect. No one is perfect, and everyone is uncomfortable with that. 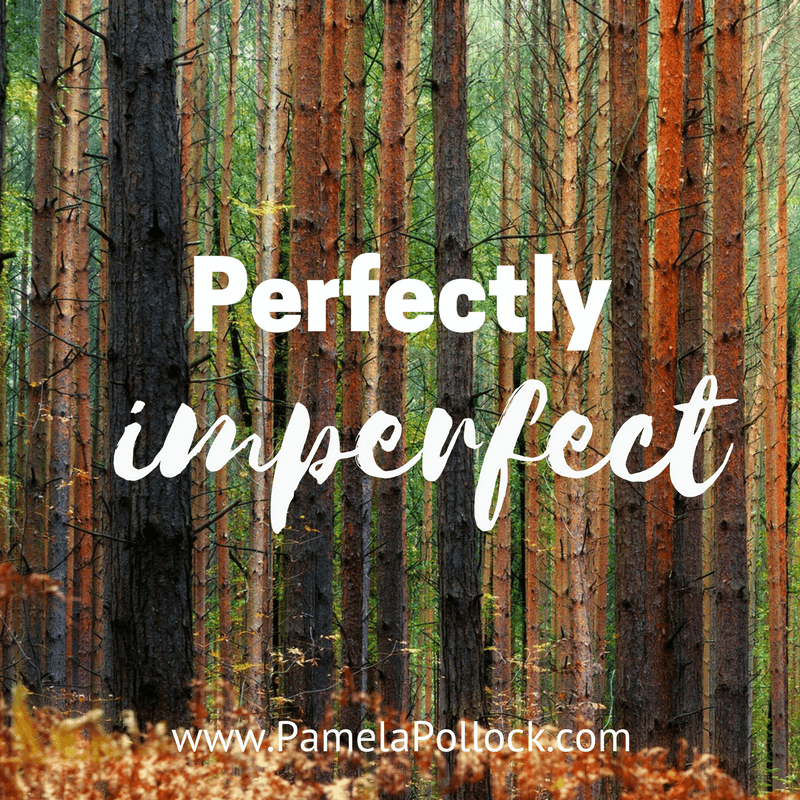 Look around you at all the products that address imperfection. Look at what marketing and the media do with imperfection. It’s very sad. It was never part of my plan that anyone be perfect. What about Adam and Eve? They did one thing wrong (imperfection) and you sent them out of the garden. Didn’t you abandon them? No, I never abandoned them. I had given them much freedom in the garden. Not eating from the tree of the knowledge of good and evil was the only non-negotiable, and they chose to believe Satan. That was a very sad day for me. The rest of history is based on that. There is much evil in the world, and my children need to learn how to trust me and not listen to Satan. He continued…Today, when you believe Satan’s lies about yourself, you feel cut off from Me, causing loneliness and fear. I want to assure you I haven’t gone anywhere. I’m right here, and I absolutely don’t expect you to be perfect. I love you exactly the way you are, with all of your imperfections. The more time you spend with Me, the more you will see the truth of that. I didn’t abandon you as a child, even when you asked Me to take you out of your painful life. I had so much more for you that I didn’t want you to miss. I knew that one day I’d be able to take all of that pain and give you an experience of freedom that as a child you could not comprehend. The enemy is the one who convinces you that you have to be perfect. The more you listen to me and not to Satan’s lies, the better you’re going to feel. I am equipping you to catch the lies more quickly so that you can refute them and stay safe. You are learning, and you’re doing a great job. That’s precisely why I chose you to create Dare to Dream. You’ll be amazed at all the fun things I have in store for you. You are my precious, beautiful, creative, amazing daughter, and I have entrusted much to you because of who you are. You want to learn. I am guiding you. You have My heart, and I am training you to take care of yourself and others because I love you so much. I’m sorry that you struggled so much with your imperfect parents. That was never My intention. I created all parents to love and cherish their little ones, but because their minds and hearts are often wounded, they in turn wound their kids. That’s why I sent Jesus, to make a way for those who have been hurt to free them from their man-made prisons. I know it seems like you have been suffering for a long time, and you have. I want to remind you that you have eternity to spend with Me, free from all pain and suffering. One day you will see all that I have been lovingly and meticulously planning for you, and no one can ever take that away from you. See, I’ve just about written your first blog post for you, haven’t I? How’s your anxiety now?